Your husband bravely and faithfully serves his country, and as a military wife your own service is no less remarkable. But who serves you as you live out your calling as a military wife? 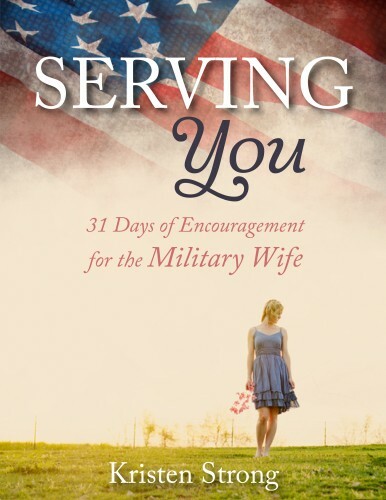 In one small way, I pray Serving You: 31 Days of Encouragement for the Military Wife does just that. Also available on any computer. An e-book written for military wives, Serving You blends solid biblical truths with relevant, personal military life stories giving the military wife confidence in her calling while strengthening her heart for the demands this lifestyle requires. While no two military wives’ personal circumstances look identical, all military wives share common threads woven throughout this lifestyle. We all must figure out how to make friends, fit into new communities, adapt to constant change, and fill roles well beyond that of wife and mom. We battle frequent seasons of loneliness, fear, separations, and feelings of missing out. So whether a military wife has just walked down the aisle or driven through her tenth base, whether her husband has deployed several times or not at all, Serving You will speak to each woman in emotional, spiritual, and practical ways. In addition to the devotional body, which features 31 topics centered around a common aspect of military life, each daily devotional includes a significant quote and poignant prayer. Some topics explored include cultivating friendships, asking for help, marital roles when you’re flying solo, fighting fears, and adapting to change. Serving You will strengthen your identity in Jesus, helps you see yourself the way He does, and assures you that God—not Uncle Sam—has placed you where you are for a divine purpose. “Even though I’m not a military wife, this devotional bridges the gap and speaks to the heart of women everywhere – women who have husbands that perhaps work often or work late and need the extra dose of encouragement that Kristen so lovingly provides. As a wife and mother who loves her morning devotions, I’m thrilled to be able to add this incredible, new EBook to my devotional library.” ~Allison C.